Tamales are such a magical thing...when I was little, my grandparents would take us down to Puerto Peñasco, Mexico, where we'd buy them from a lady on the beach. She would come by with a plastic bucket full of the freshly made delights, and my mom and I would run for cash while my grandmother rolled her eyes and warned us about the various scary things that could be in the little mystery packages. We were never deterred, though, and ran just as gleefully to any Mexican restaurant that opened back home in the Philadelphia area, usually only to be disappointed by something more closely resembling cornbread. And occasionally some kind of artificial sour cream. Blech. Since moving to California where tamales are easy to find, my options have again become limited by my allergy to peppers. 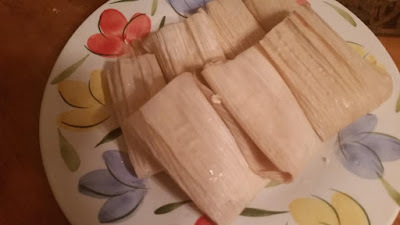 Making them at home is a bit of a chore--most Mexican families only make tamales once a year for Christmas--but it seems a more manageable task with my nifty Instant Pot! 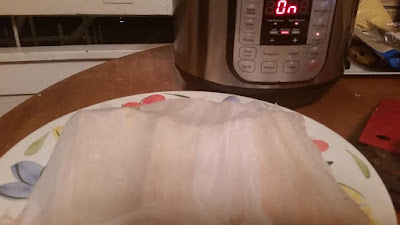 This makes about 24 tamales, but you could cut it in half if you just wanted to do one round in the Instant Pot - only about 12 fit in there at one time. Heat the oil and brown the meat, about 5 minutes on each side. Use the saute function on the Instant Pot or a heavy pot on the stove. This should leave you with a lot of yummy brown stuff (fond) on the bottom that will add flavor to your tamales. Add the onions to the pot and saute for about a minute before adding the spices and beer. 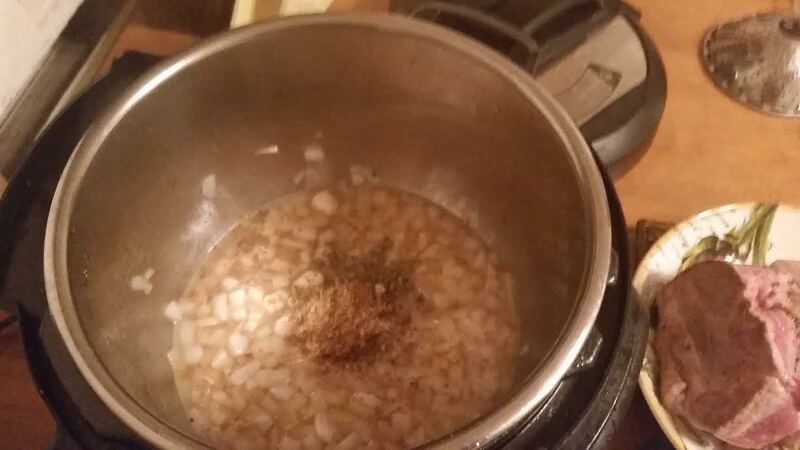 Stir well and cook until onions are a little soft. Add the lemon and orange. Return the meat and any juices it has deposited on the plate to the pot. 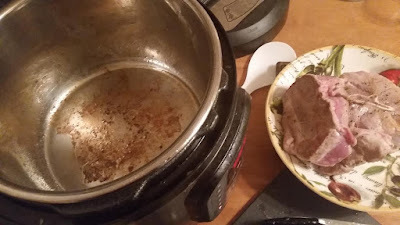 If using the Instant Pot, set to "seal" and press "manual". Adjust to 60 minutes cooking time and do a natural release. 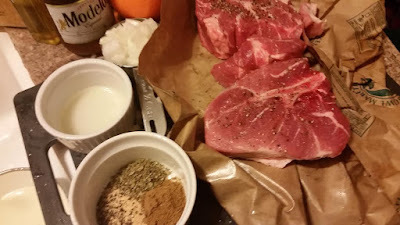 If using the stovetop, add more liquid to just cover the meat, bring to a boil, reduce to a simmer, and let cook for 2-3 hours until the meat falls apart easily. Check periodically to make sure it has enough liquid. Remove from heat and let cool for one hour or overnight in the fridge. Prepare the corn husks: from one or two packages of dried corn husks, pull out about 30. Put them in a large pot or bowl and submerge in hot water (put a plate on top to hold them down) for at least an hour. Add the mix to a very large bowl with the baking powder, the salt and the broth. Mix well. 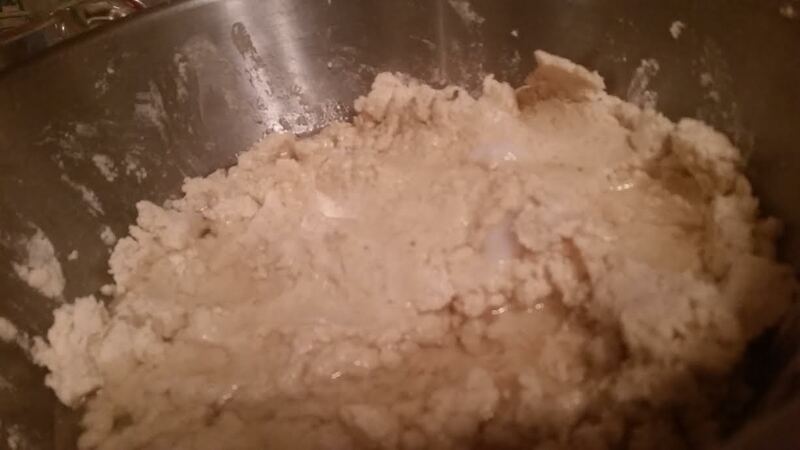 Add the melted lard and mix well again, kneading for a couple of minutes. If the dough is thick but spreadable, you're good. If it's very stiff, add a little more broth or water (start with half a cup). 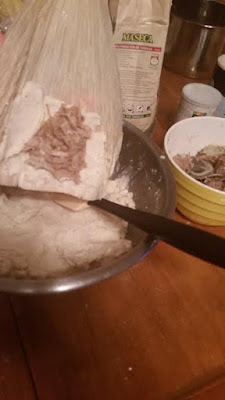 Remove the husks from the water and set up a long counter or a table with the masa bowl, the meat, the husks, and a platter to put the folded tamales on. Spread some masa on the larger husks, doubling up with the narrower ones. Add a spoonful of meat to the center and fold each side over the center. Then, fold down the long empty tail of the husk. Repeat the process until the masa is gone. I have some extra meat that I'll use for tacos or salads tomorrow. 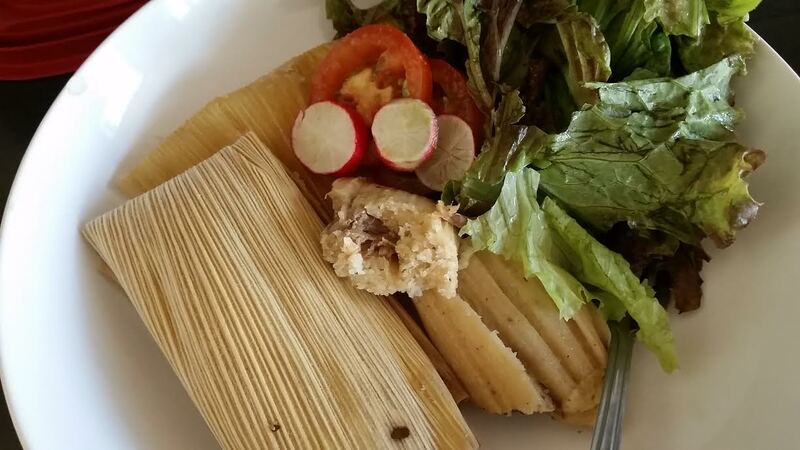 The tamales will look like the photo below when they're ready to go! Steam the tamales: I use a steamer basket like this one. Instant Pot: put 1 cup of water in the liner pot. Set the trivet in the pot and a steamer basket on top. 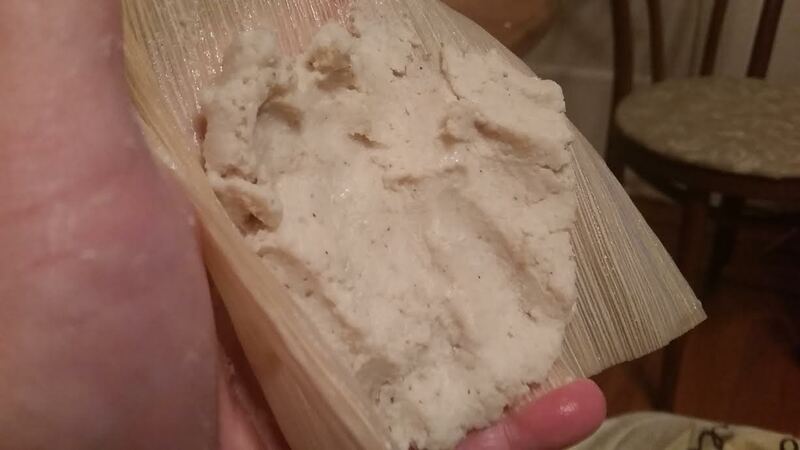 Place a dozen tamales in the steamer basket, open end up and folded end down. Set to "seal" and press "manual". Adjust to 40 minutes and do a natural release. Serve with tomatillo salsa and/or fresh veggies! If you make more than a dozen, you may need to do two batches. If so, cover the second batch of tamales with a wet paper towel to keep the husks from drying out while they wait to be steamed. Stovetop: Put at least two cups of water in the bottom of a large stock pot, enough to create steam but not enough to get the tamales wet in the steamer basket. Set as many tamales as will fit, open end up, in a steamer basket. Steam for an hour and fifteen minutes, checking to see that the water hasn't all evaporated periodically but not too often. Add water as needed. Check for doneness and steam longer if needed. To reheat in the microwave: cover one or two tamales with a damp paper towel. Zap for about a minute per tamal, depending on the size and on your microwave.